Today is the LAST day to enter the homemade cookie giveaway! Ever since I started kindergarten, I’ve packed my lunch to bring to school (and now work) every single day. I’ve only left my lunchbox at home a handful of times in nearly 20 years for the occasional classroom pizza party or catered meal by Boss. Shockingly enough, I still enjoy biting into a simple sandwich. Normally it’s just a few slices of meat between my bread with a squeeze of mustard for moisture. Recently, I started getting fancy by adding crisp shredded lettuce. (A real splurge, I know!) But I almost always skip out on adding any more toppings, especially if they’ll turn my sandwich wet and soggy while it sits on my desk all morning. Continue reading for recipe. February 22, 2013. 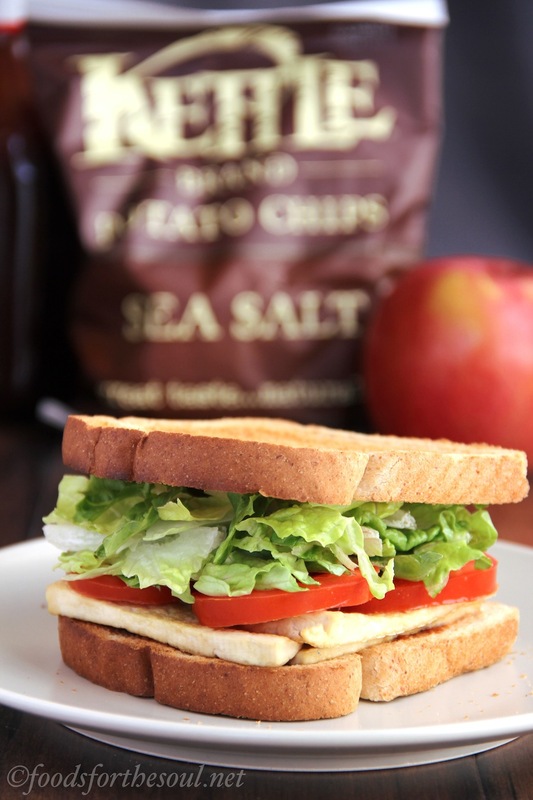 Tags: BLT, food, healthy, low fat, recipe, recipes, sandwiches, tofu, vacation, vegan. Midweek Meals. 6 comments. Quick reminder: the homemade cookie giveaway ends this Friday! Post a comment on my new URL to enter! Complaining rarely works this well. After grumbling about my lack of a lemon tree, I opened up emails from three different friends offering me lemons the very next day! Since I have yet to incorporate “no” into my vocabulary, piles of lemons now occupy half of my kitchen countertops. Although lemon cake is probably the most popular dessert in my family, I wanted to use the lemons in a more savory application too. 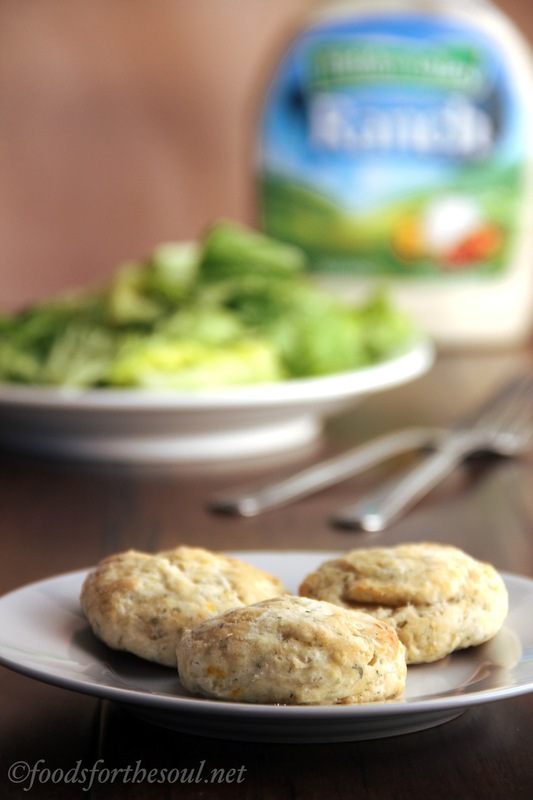 I nixed the traditional option of a marinade for fish—too many picky eaters—and settled on buttery biscuits instead. Continue reading for recipe. February 20, 2013. 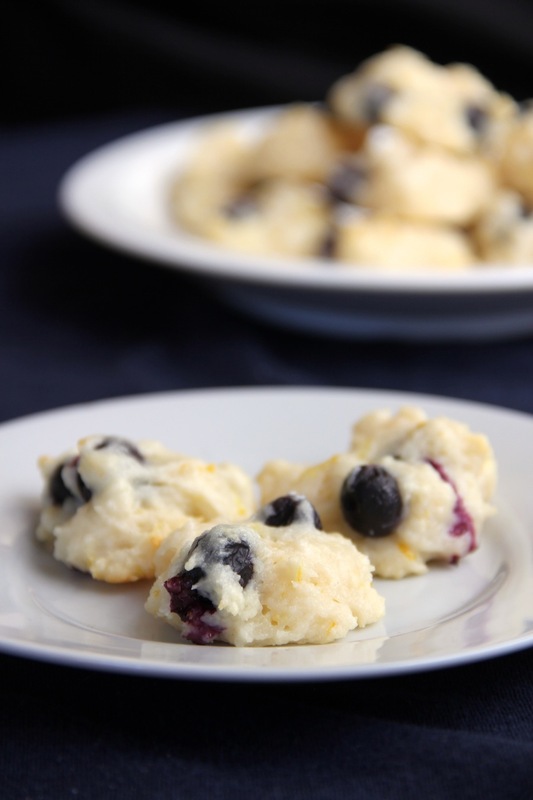 Tags: baking, biscuits, bread, food, healthy, lemon, low fat, recipe, recipes, side dishes. Baked Bliss, Satisfying Sides. 14 comments. February 18, 2013. 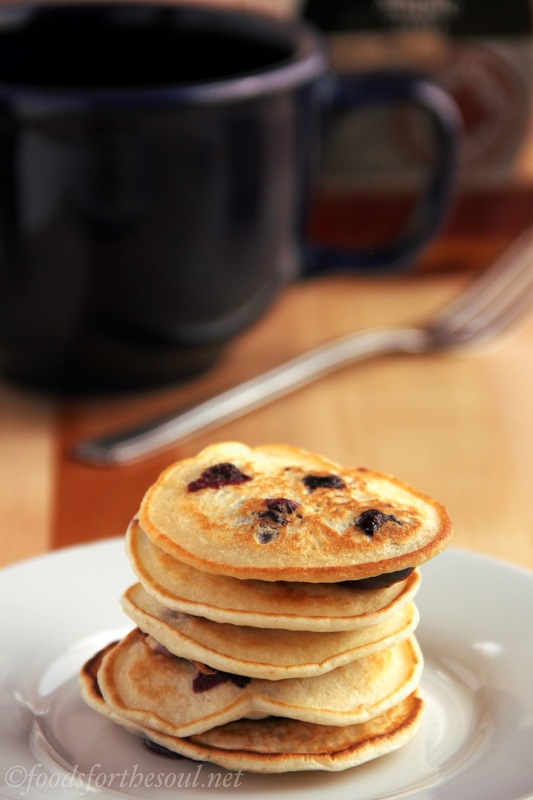 Tags: blueberries, breakfast, brunch, family, food, fruit, healthy, low fat, pancakes, recipe, recipes, vegan. Baked Bliss, Midweek Meals. 14 comments. My blog is moving to a new URL next week (http://foodsforthesoul.net). While I can transfer all of my pages and posts, I can’t transfer any of your subscriptions! Because I enjoy reading every comment you leave and smile at all of your heartfelt words, I consider you my friends—and I’d hate to end our friendships just because I change addresses! Follow my blog at its new address by either email or RSS. Follow the Foods for the Soul Facebook page. Follow me (@FoodsForSoul) on Twitter. Follow me (Foods for the Soul) on Pinterest. Post a separate comment here at the blog’s new address for each way you enter. (Each comment counts as a separate entry!) The giveaway will end at 11:59 pm on Friday, February 22, and I’ll post the winners the following day. Each winner will get to choose what kind of cookie I make and mail, so start thinking of your favorite recipes! You have a week to enter as many times as you want—ready, set, go! February 15, 2013. Tags: baking, blogging, cookies, dessert, food, giveaway, moving, social media. Giveaways. 21 comments. Throughout elementary school, I begged my mom for a shoebox on every February 13th and asked her to cut a slit in the lid. I then pulled out pink construction paper, red glitter glue, and shiny white sequins to decorate the sides. I even pressed on sparkly heart stickers for good measure! The next morning, I carefully held my homemade Valentine mailbox on my lap as Mom drove across town. At school, I placed it on my desk just like the rest of my classmates. After lunch, we walked around the room, dropping paper cards into each person’s mailbox while the parents set up for our classroom party. Although I dreaded the politics of handing out those little Valentines—you had to make sure the sappy ones didn’t go to any of the boys!—I always loved the sugar cookies and conversation hearts that the parents brought in. It was probably a good thing they never made these chocolate dipped marshmallows… I would have eaten every last one and refused to share, even with my crush! Continue reading for recipe. February 13, 2013. 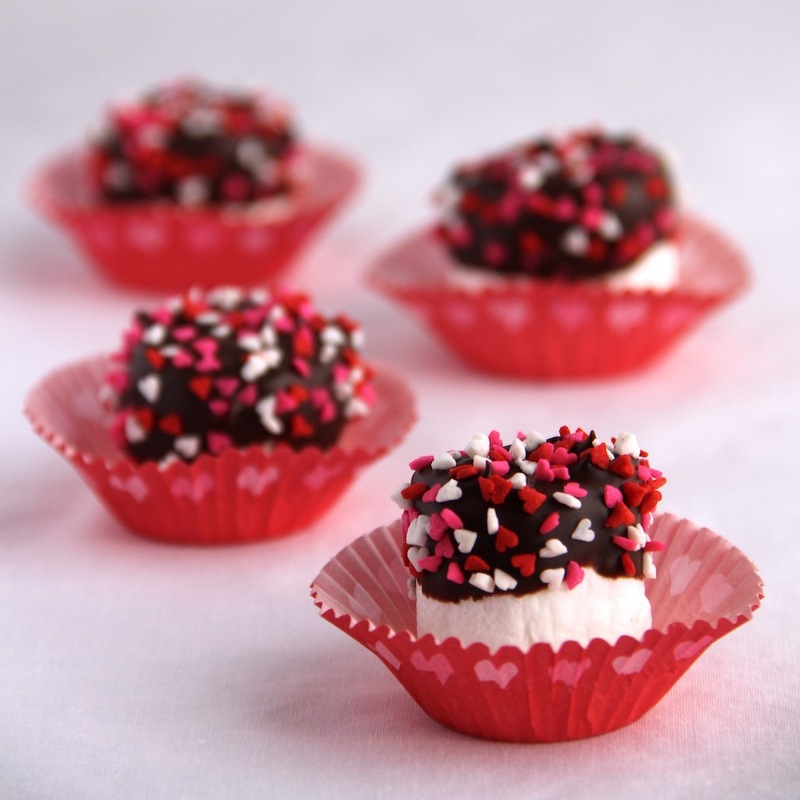 Tags: candy, chocolate, dessert, food, low fat, marshmallows, recipe, recipes, tradition, Valentine's day. Delicious Desserts. 26 comments. Today is our lucky day! Andrea from Mrs. Webb in the Kitchen is going to teach us how to make special truffle stuffed strawberries. Just in time for Valentine’s Day! Andrea and I met in high school and bonded over cold nights marching around the football field for band and giggling our way through nasally accents in French class. Although we lost touch for a few years after graduation, I found out last fall that she now works in a bakery—my dream job! She has picked up lots of tricks and tips, especially in the cake decorating world, and I begged her to share some with us. In exchange, I wrote a guest post for her with a recipe for heart-shaped french toast for two. Be sure to check it out after reading her truffle tutorial, as well as her dainty French macarons and moist gingerbread cake with molasses frosting! I’ll be the first to admit that I am a sucker for Valentine’s Day. Even before I had a sweetheart of my own, I adored a day dedicated to pink hearts, pretty flowers, and candy. In my elementary school years, I couldn’t wait to hand out silly and sweet paper valentines to my classmates- each of the pre-printed sentiments carefully sorted into classmate, crush, or friend-worthy categories! This year, in lieu of passing out stale old conversation hearts, I thought I’d try my hand at some hand-crafted truffles. 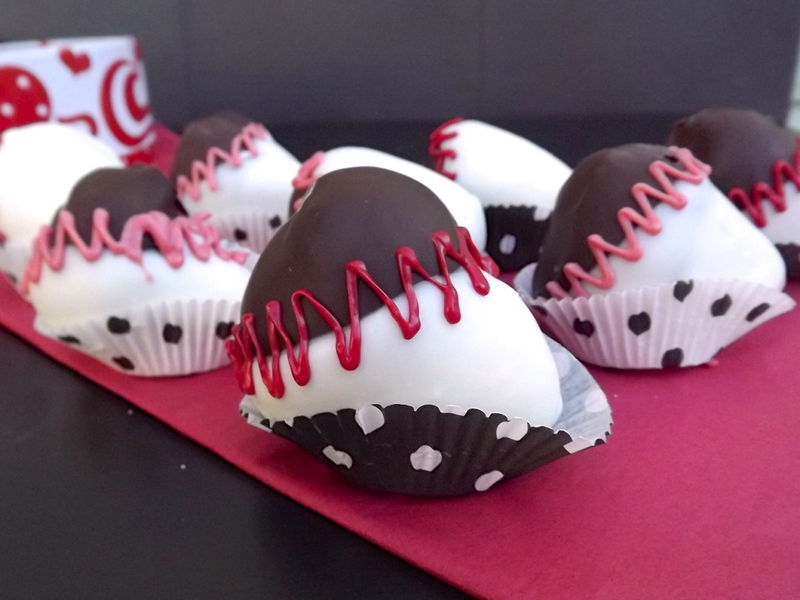 These strawberry truffles, however, are a fusion of two of the most classic heart day treats: truffles and chocolate covered strawberries! My original plan was to add a berry-flavored extract to ganache to make a traditional truffle interior. Instead, I decided to stuff the ganache inside a real, live strawberry. Continue reading for recipe. February 11, 2013. Tags: blogging, candy, chocolate, dessert, food, fruit, recipe, recipes, strawberries, tutorial, Valentine's day. Delicious Desserts. 6 comments. Then Mom would sigh and reluctantly allow us each to eat one sweet treat before making us a special breakfast. She usually whipped up pancakes, waffles, or cinnamon sugar toast — practically a dessert itself! As soon as she set our plates in front of us, we’d inhale the food before rushing off to school. But if February 14th fell on a weekend, we’d enjoy a more leisurely breakfast. Mom would bake Pillsbury croissants or even homemade muffins, if we promised not to sneak extra chocolates while the pastries cooled on the counter. And with such festive muffins waiting for us, we readily agreed! Continue reading for recipe. February 8, 2013. 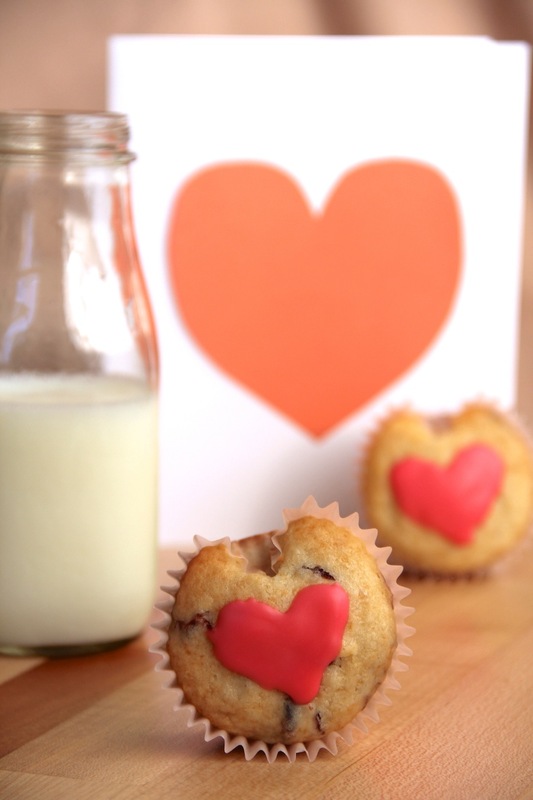 Tags: baking, breakfast, brunch, family, food, healthy, hearts, low fat, muffins, recipe, recipes, Valentine's day. Baked Bliss, Delicious Desserts, Midweek Meals. 24 comments. But that didn’t quite seem appropriate for our drab hallways and professional environment. (Probably a safety and productivity hazard too, with all of the attention it would attract!) So I settled on making them celebratory treats instead. Continue reading for recipe. February 6, 2013. 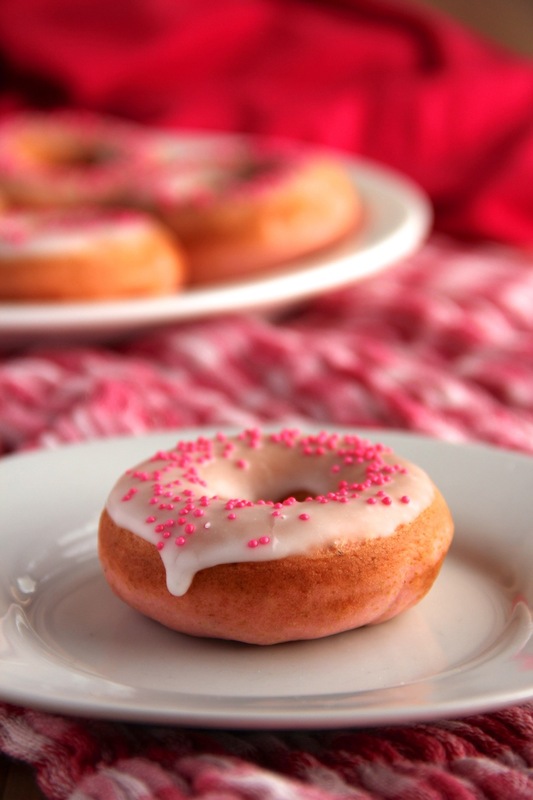 Tags: baking, breakfast, brunch, dessert, donuts, food, low fat, pink, recipe, recipes, Valentine's day, vegan. Baked Bliss, Delicious Desserts, Midweek Meals. 33 comments. My last post didn’t publish correctly… I was thanking you for all of the thoughtful comments you left on my sweet and sneaky veggie series! I also asked what vegetables you’d like to see in the next sequel series, so please leave a comment with your requests! Everyone I know owns a lemon tree. My coworkers, my parents, the mailman, the speedy grocery cashier, that one house on my morning running route… Everyone but me. I sulked for a while over that fact. They were so lucky; they could walk outside and pick citrus any time a lemonade, lemon bar, or lemon meringue pie craving hit. Me, I had to plan ahead for my cravings to ensure I wrote “lemons” on my weekly grocery list. But then the light bulb in my brain flickered on… Continue reading for recipe. February 4, 2013. Tags: baking, cookies, dessert, fat free, food, fruit, healthy, low fat, recipe, recipes, sweets, yogurt. Baked Bliss, Delicious Desserts. 32 comments. 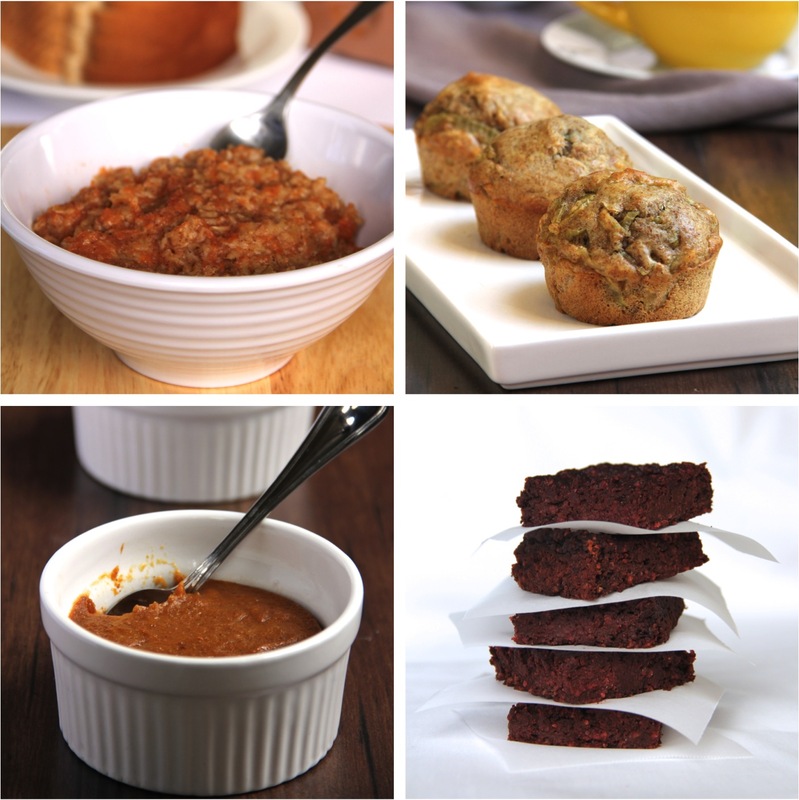 I was amazed by your responses to my mini series on sweet and sneaky ways to eat your veggies. I expected people to think my recipes were insane, or maybe imaginative at best, but you surprised me with many thoughtful compliments instead! I smiled while reading each of your comments, and a few of them really touched my heart. Continue reading. February 2, 2013. Tags: baking, breakfast, chocolate, dessert, food, healthy, low fat, recipe, recipes, reviews, vegan, vegetables. Baked Bliss, Delicious Desserts, Midweek Meals. 16 comments.